I went down to the National Museum again yesterday as I wasn't able to complete the visit during my last trip. Yeah, there were THAT MANY things to see in there and I, for one, am the type who like to take my own sweet time to soak in everything. It's kinda fun to get lost inside all on your own. I guess that's part of my Quiet Me Time. For a moment, just step out of the hectic hustle-bustle, and for a while, just fall off the radar, disappearing into the abyss of silent serenity. During this second visit, I only visited the Singapore History Gallery where I was only done halfway when they had to close at 6pm during my last visit. I took 2-1/2 hours to complete the remaining portion of the gallery which kinda tell you how much time you need to allocate if you want to complete the National Museum visit. Mind you, there is more than one gallery in that building. 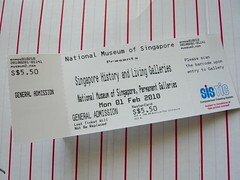 There is also the Singapore Living Galleries in addition to several ad-hoc exhibitions held from time to time. The National Museum visit has always been an item on my Bucket List and it is embarrassing to admit that I took THAT LONG to check it out when I travel past it almost every other week. Even more embarrassing is the fact that I ish National Museum virgin. Well, not anymore now! Being an avid story teller, I always love a good story. So what better than one that is about the very piece of earth that you are standing on? I have learnt a lot and possibly some of the best hours of my life that I've spent. Here's one of what I have learnt. 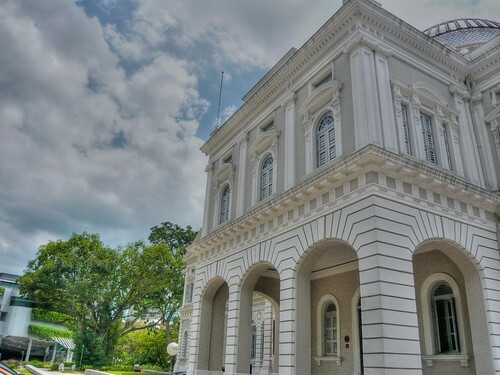 We all know Sir Stamford Raffles founded the city of Singapore back in 1819. However, what people don't know was that it was Major William Farquhar who did most, if not all the work of transforming Singapore. The former was possibly a mere figurehead who perhaps is needed for his signature on papers. Then we also know that Farquhar was later on fired as he deviated from Raffles' city master plan due to lack of funds. A conflict ensued and the East India Company took the side of Sir Stamford Raffles and subsequently influenced the historians to archive in favour of Raffles. So here's the thing. We have schools, golf club, hospitals, hotel, beer and even a airline cabin class named after Raffles today. Imagine, if the EIC hadn't kelonged the historians, none of these would have existed. More little snippets of what caught my eye at the Museum in the next few days. Stay tuned. Suggestion:- Ever been to Chinatown Heritage Centre? I like the interactive display. Smaller than the other museums but very interesting to visit. There are some interesting stories of the previous occupants to satisfy your curiosity too. Desiree: No, I have not heard of the Chinatown Heritage Centre. Will be interesting to visit. Perhaps next week.